Why I read this book: it fit nicely into a challenge from the College Students group and I always meant to read it anyway. Goodreads summary: "Set like its predecessor in war-torn Afghanistan, A Thousand Splendid Suns uses that tumultuous backdrop to render the heroic plight of two women of different generations married to the same savagely abusive male. Born out of wedlock, Mariam was forced to marry 40-year-old Rasheed when she was only 15. Then, 18 years later, her still childless husband angrily takes an even younger wife. Hosseini renders the story of Mariam and her "sister/daughter," Laila, with persuasive detail and consummate humanity. Their abject situation leaves them no emotional space for idle philosophizing; their resistance is from the very core of their being." Great review! This story is so beautiful. I have not read the Kiterunner, but the movie made me cry. I really enjoyed this one too, Mariam was a wonderful character to read about. I'm so glad to hear of more people reading this book. I can't say enough good things about it. Mariam broke my heart and I teared up too. Laila was brilliant. This book really gives you an inside look into Afghanistan and the plight of its people, not just the surface view we get on television. One of my favorite books and I had high expectations for it after reading The Kite Runner. The characters of Mariam, Laila, and Tariq had me rooting for them all the way and you are right about this book illustrating what it is like in Afghanistan. For me, this story put a face on all the people we hear about on the news each day. I was emotionally drained by the end, but something I will one day want to read again. A agree with everything you've said, it's a stunning and heartbreaking novel. The Kite Runner is just as good, he's written one for the women's story and one for the men's. I cried quite a lot reading both of them. I had to read this for a non-western lit class, and I loved it. I love the relationship between the two women, and Mariam is so brave, I loved her. truly a heartbreaking story, but so good! I loved this book. I particularly loved Laila's father and was completely emotionally invested in what happened to him. I would strongly recommend The Kite Runner, but know that you will spend most of it angry. This book was sad. The Kite Runner inspires anger and bitter regret. This is one of my favourite books. I was completely moved by it. Another good one to read is "Born Under a Million Shadows". It's quite beautiful. I read this a few years ago and it's still one of my favorites! Though I thought the book was lacking just a bit in the "big picture" department, I did think it was almost compulsively readable. I read it straight through on a flight one afternoon and found it very moving. This is one of those books that got sooo much hype that I kind of stayed away of it because of that. Glad to see it stayed the test of time. I should look into checking it out now that fervor has died down! I really enjoyed it, too, because it opened up a culture unfamiliar and showed the personhood of people who are being treated like animals. It's beautifully written, too. I thought that this book was beautiful, heartbreaking, infuriating, and transformative. I don't know how anyone who read this book could failed to be moved by the plight of these women and spurred to action to ensure equal rights for everyone. I did know about the oppression of women in Afghanistan before 9-11, but the world didn't pay attention until the World Trade Center went down. This book shows such a clear illustration of the hopelessness and fear that these women lived with. 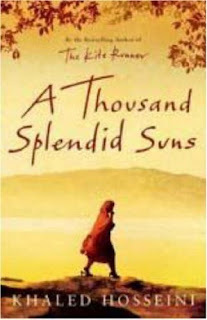 Must be an enjoyable read A Thousand Splendid Suns by Khaled Hosseini. loved the way you wrote it. I find your review very genuine and orignal, this book is going in by "to read" list.